Lifting weights supports increases in lean muscle mass and provides a method of calorie expenditure. Specific factors determine your recommended daily calorie intake for weightlifting which include training intensity, age, gender and body composition. Selecting the appropriate calorie amount and type of calories is imperative to promote muscular growth and energy for the next weight training session. There are certain factors that determine your daily calorie expenditure including body size, gender, and age. Larger individuals burn a greater number of calories compared to lighter weightlifters. Older people expend fewer calories than younger exercisers due to declining muscle mass and calorie burning potential. Males possess a greater amount of muscle mass compared to women, which results in increased calorie burn during activity. According to facts obtained from the book, "Essentials of Exercise Physiology," highly active men, who range from 25 to 50 years old, expend an average of 2,900 daily calories and active females of the same age range burn an approximate of 2,300 calories a day. By using this estimate, you can calculate your recommended daily calories to consume for weight training. According to the "Harvard Health Publications" website, a 125-lb. 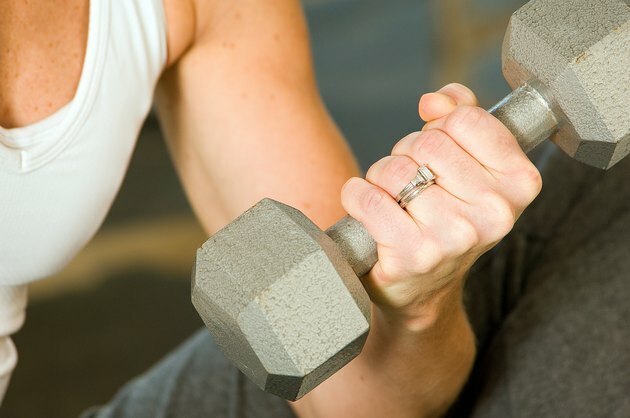 person who participates in an hour-long vigorous weight training session expends 360 calories. To compare, a 185-lb. person performing the same hour-long vigorous workout burns 532 calories. This comparison shows the difference body weight creates in calorie expenditure. The "Columbia University" website, notes that research proves consuming an extra 2,270 to 3,630 calories a week along with consistent weight training could build up to 1 lb.of muscle over a seven day period. A male weighing 180lbs. who is moderately active, needs an approximate 2,700 daily calories. He should increase his total to a minimum of 3,200 calories to promote gains in muscle mass. Throw in a daily weight-training session and calorie requirements escalate to 3,700 daily calories or 1,000 extra calories daily to compensate for weight-training calorie burn. To maintain health and performance, select calorie sources from foods that contain good fats and monounsaturated fats from sources like nuts and salmon. For energy to power through your weight-training workouts, consume carbohydrate rich food from sources like brown rice, whole grain breads and vegetables. It is also important to round out your calorie intake with lean protein calorie sources like chicken, turkey and fish. Consult with a registered dietitian to get a detailed understanding of what type of calories are best for your individual goals. University of New Mexico: Making Sense of Calorie-burning Claims; Robert A. Robergs, Ph.D., and Len Kravitz, Ph.D.